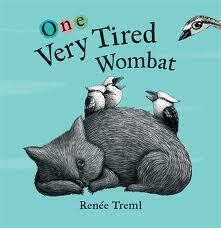 Really the inspiration for this post came from the book, One Very Tired Wombat, by Renee Treml which I found in our local independent bookstore. 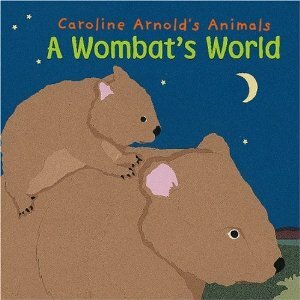 I was already partial to wombat stories and finding this book was like finding a hidden treasure!! 1 very tired wombat settles down to sleep. You can just imagine what happens next when 2 curious curlews, 3 furtive frogmouths, 4 peaceful pigeons etc start to gather around the tired wombat disturbing his much needed sleep. He has, after all, been up all night foraging for food! 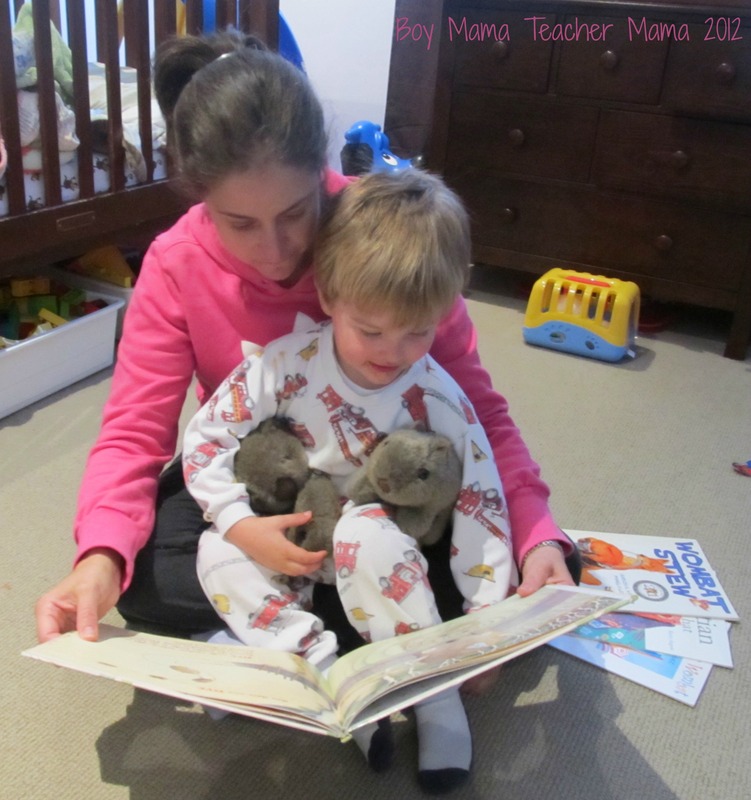 As you read the story you can feel just how tired the wombat is and how frustrated he becomes by all the different creatures who “visit.” The story is told in delightful rhymes with wonderfully rich vocabulary such as “furtive,” “garish” and “cackling” which also makes this book a great teaching tool. 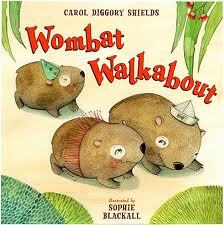 Six woolly wombats went walkabout. They didn’t see the dingo with the hungry eye. This book was one of our first introductions to Australian animals and words. The book features the infamous wombat, kookaburra and dingo; introduces the reader to the wattle tree, the billabong and gum nuts; and teaches us what a swag bag, a walkabout and a bloke are. The story itself is a counting (backwards) book about a dingo who snatches up wombats for his dinner as they go on their daily walk. Once the last two wombats realize the others are missing, they quickly create a trap for the dingo and prepare to rescue their mates. 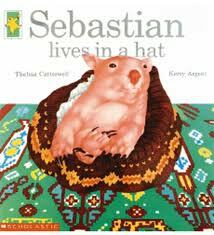 Sebastian lives in a hat. It is a brown woollen hat. Sebastian’s a pink, fuzzy wombat…. Sebastian hasn’t always lived in a hat. He used to live in a warm dark place. It was his mother’s pouch. This is a different sort of wombat story. This story tells of Sebastian, a baby wombat, who was rescued after his mother was hit by a car. 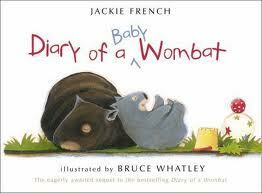 It tells of what the rescuers do to care for the baby wombat so it can be released back into the wild. And while being cared for Sebastian stays warm and cozy in a hat. In this story, Dingo has plans to cook up some wombat stew. Thankfully, Wombat’s mates have other plans. They trick Dingo into adding all sorts of unappetizing ingredients such as mud, feathers, flies and gum nuts to his stew before adding Wombat. The result? 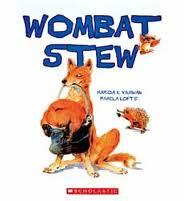 A terrible stew and one wombat saved from becoming Dingo’s dinner. 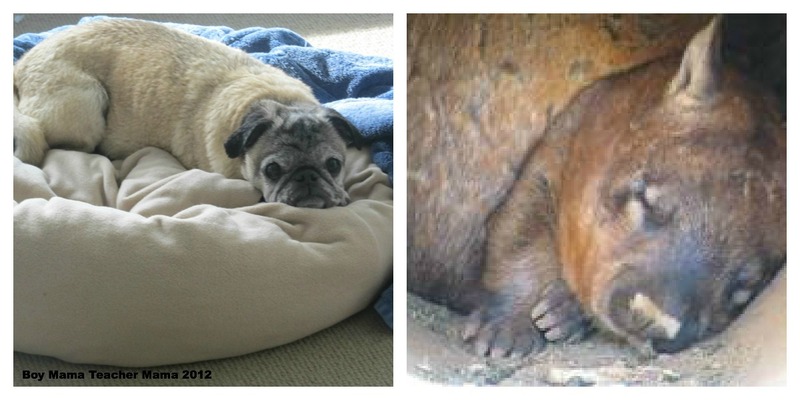 Do you have any favorite wombat stories? Please share! 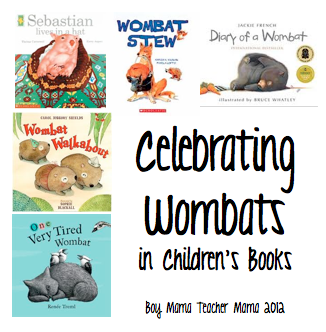 Want Some More Wombat Fun? Get some wombat clothing to spice up your wardrobe. That’s a great Wombat Day cake you made. 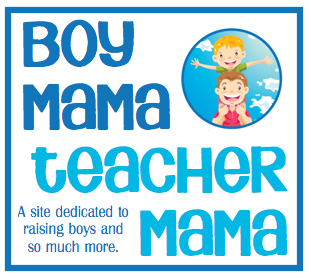 Would you mind if I put it up on my website, with a link and credit, of course. We just checked out Wombat Christmas — never too early for a Christmas book! 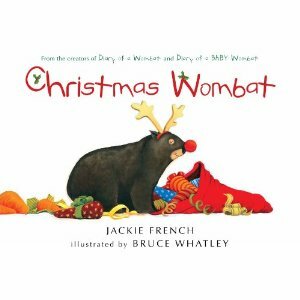 Wombat Devine is also a lovely Christmas themed story. Wombat tries out for all the parts in the nativity play but someone else gets picked everytime until they find the perfect part for him (but I’m not going to give away the ending!). I read Wombat Divine a long time ago, but didn’t add it to my list for some reason! What did you think of Wombat’s Christmas? Love, love, love obviously. Such a great lot of books too! 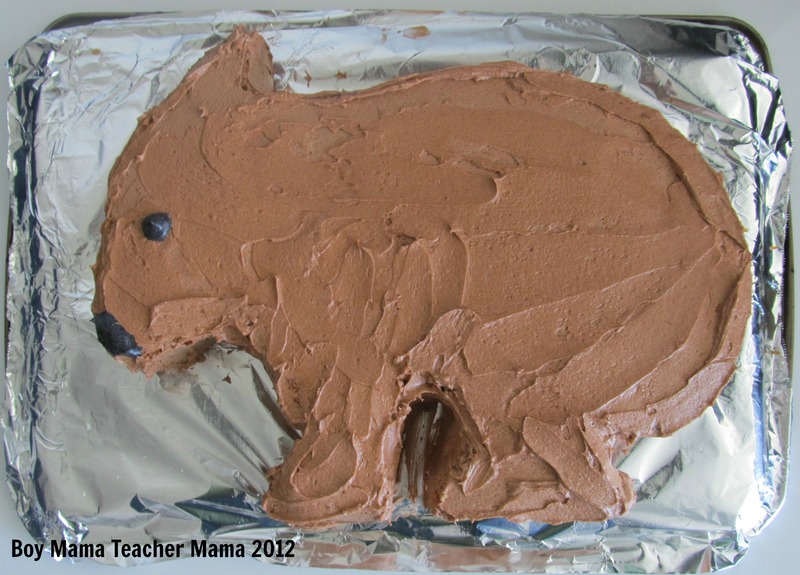 Happy Wombat Day! You know I just had to share this! I love wombats too- there is something very unique about them- but didn’t even know it was Wombat Day. You’ve put together a wonderful list of books and ideas here.